Pitcher Bob Turley passed away last week at age 82. 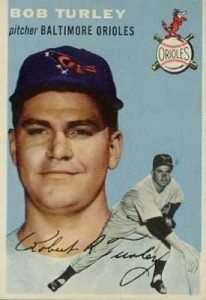 He debuted with the 1954 Orioles. A Baltimore paper offered a unique retrospective of his career and life. I haven’t raved about the merits of www.sportscollectors.net lately. I checked the SCN results board. Of recorded attempts, Turley had signed 496 out of 531 TTM autograph requests. A few collectors had written him after his cancer had made signing impossible. Also, Turley had several retirement homes in the last decade, making it possible for a few requests to get lost in the shuffle. Nevertheless, a pitcher who batted more than .900? I loved seeing examples of his responses. He returned collector donations. He wasn’t keen on keeping extras collectors included as gifts. He’d sign it all. Best of all, he was willing to sign on request “1958 Cy Young” and his “Bullet” nickname. Do some collectors ignore the piece-of-cake signers, thinking they’ll be available forever? The roster of autograph all-stars is shrinking. Happened to me with John Wooden. He was a great signer and unfortunately I never took the time to send to him.